If you want to show your tough side, consider silver brass knuckle necklaces. Brass knuckles have been used for years as self-defense weapons. They are usually made from a cast piece of metal, usually steel, that has been designed to fit around the knuckles of four fingers. Their purpose is to strengthen the force of a blow from a fist. Brass knuckles, sometimes called "knuckle dusters" are illegal in several states including California, New York, Illinois and Massachusetts. In other states they can usually be purchased wherever weapons are for sale and more informally at swap meets, gun shows and flea markets. They have remained popular as a symbol of toughness and are often worn on a chain around the neck. Biker fashion has included brass knuckle necklaces as a staple for both men and women. In 2004 several punk and rock bands began to incorporate brass knuckle themes into their lyrics and brass knuckle necklaces into their wardrobes to reflect a rebellious, tough persona. The necklaces were usually designed using very small brass knuckles up to about two inches in length. Joel Madden, one of the lead singers of the pop band Good Charlotte, included a version of the necklace in his clothing line, Made. The brass knuckle pendant was also included in the PNUT jewelry line by H2O guitarist Rusty Pistachio. Famous young stars such as Hillary Duff were photographed wearing the silver brass knuckle necklaces - and the knuckles became a fashion trend. 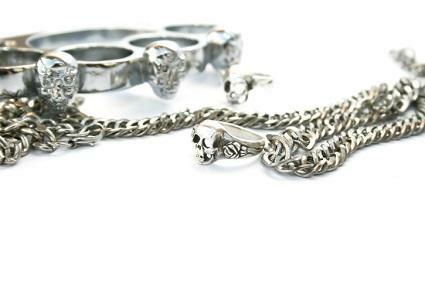 Silver brass knuckle necklaces continue to be a fashion trend for both men and women. They are widely-available wherever trendy, pop-inspired clothes are sold. There are also several online jewelry stores that specialize in knuckle pendant jewelry. You can select from a variety of sizes, finishes and types of chains. Brass knuckles that are worn as necklaces tend to be significantly smaller than the brass knuckles used as weapons. Some are as small as 1.25 inches long. This is done to visually-differentiate the necklace pendant from the weapon. The smaller pendant is also much lighter and more comfortable to wear. Most brass knuckle jewelry is usually made from steel or a base metal. Some is made from sterling silver. You can verify that the necklace is sterling silver if the silver content is engraved on the piece as ".925 silver." This means that the piece of jewelry is made of 92.5 percent silver. Otherwise the piece is silver plated or finished with a "silver-like" material. The silver plated finish is not as durable as a piece of jewelry that is made of sterling silver. A brass knuckle necklace is usually worn on a heavy silver or silver-looking bead chain such as a shot bead or ball chain. The ball chain or shot bead chain is made up of hollow metal beads alternatively strung onto a durable chain with hollow metal tubes. The resulting chain is light in feel, flexible and very durable. This is the same type of chain that is usually used for dog tags. The chain length can vary from a chocker length of 15 to 16 inches on a woman to a longer 24 to 30-inch length on a man. The brass knuckle look also comes in earrings and rings and in fashion. MetalMafia offers mini brass knuckle ear studs to match their various sizes of necklaces. Other retailers offer specialty rings with the brass knuckle-motif. T-shirts with the brass knuckle design are widely available for men and women in the trendy clothing stores that offer musical group-inspired fashions.